The E.C. 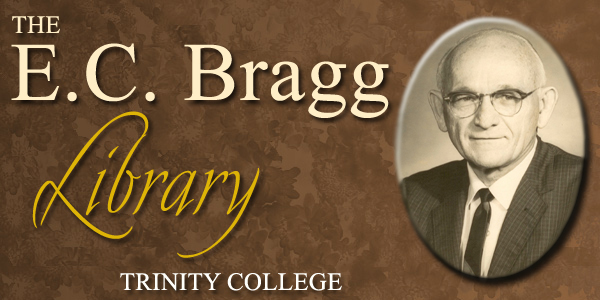 Bragg Library at Trinity College of Florida consists of an online digital collection of the lectures, notes and writings of Dr. E.C. Bragg and a collection of approximately 1,200 rare volumes of books on systematic theology and biblical studies. The online library allows users access to re-mastered audio lectures on a variety of theological topics and copies of Dr. Bragg’s notes and writings. The collection of classic reference works were donated by the family of Dr. Bragg upon his death in 1995. The books were published prior to 1900 and are housed on campus in The Raymond H. Center Library. They are available for students and scholars to review during normal library hours. Dr. Bragg was president and salutatorian of the first graduating class of the Florida Bible Institute (Trinity College) in 1934. After graduation he pastored churches for eight years and returned to Trinity College in 1942 where he taught full-time until 1990. He earned an MA from Trinity and was awarded an honorary Doctor of Divinity from the College in 1948. In 1995 Dr. Bragg went to be with the Lord, whom he loved deeply and served faithfully.